Combine the chocolate sandwich cookies and the cream cheese in the food processor and process until smooth. You might need to use a rubber spatula to mix a couple times during the process until you have a relatively smooth cookie paste. Drop spoonfuls of the cookie mixture on a parchment paper lined plate or sheet tray. Place in freezer for 30 minutes. Melt the chocolate over a double boiler until smooth. Remove from heat and let cool slightly. 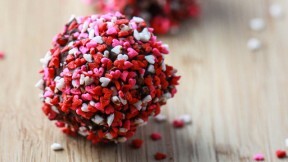 After 30 minutes, remove the truffles from the freezer and re-roll each into a smooth ball. Drop in the melted chocolate then roll in the sprinkles. Place back on the sheet try or plate and place in the freezer for another hour until firm. Truffles will remain fresh in the fridge or freezer for up to two weeks.